Last night we had friends over for dinner and I made apricot pie for dessert. Ever since I posted pictures of the apricot tree, I meant to post the recipe for this dish. Simply forgot to take a photo whenever I made it. Normally I sprinkle a little bit of icing sugar on top, but could not for this pic, as the pie came straight out of the oven. Later on, when we finally had dessert, the day light was gone.. Delicious on it's own, but even better with a little bit of whipped cream and a glass of Sauternes. Combine dry ingredients and place into a food processor. Add butter and process until mixture becomes crumbly. Add the egg yolk and just enough milk so that a smooth dough ball forms. Roll out (I place the dough into a open cut freezer bag) and line the tart tin. Refrigerate for a couple of hours (I often leave it in the fridge overnight, it cuts down on preparation time on the actual day). Prick with fork and bake in preheated oven (180 degrees) for approx 15 minutes (until light golden) Take out off the oven and let cool. 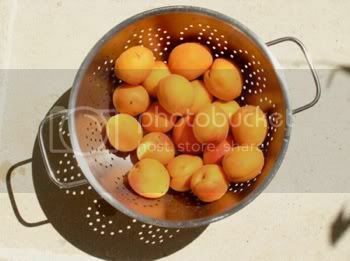 Wash and dry the apricots, cut them in half, remove the stones. Sprinkle the cut sides with a little sugar and set aside. Place the butter and icing sugar into a mixing bowl and beat until light and fluffy. Add the ground almonds and mix well. Add one egg at the time and beat until all combined. Pour the mix into the pre baked pie shell. Place the apricots on the dough, cut side up. No need to push them in, as the dough will rise when baking. Place in preheated oven (180 Celsius/350F) and bake for approx 40 minutes. 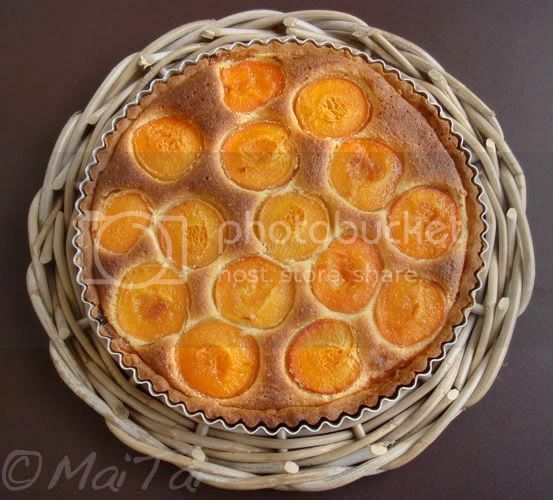 MaiTai Thank you so much for posting your apricot pie recipe. I hope you had an enjoyable evening but, how could you not, good food and good friends make a special evening. I am having such fun with all of our posted recipes...pretty soon we will be able to publish our own cookbook or even start our own cooking school! Hi andiamo! The evening was truly fun, love the warm summer evenings where meals just go on forever..I too enjoy our recipes and banter so very much..what a great idea to publish our very own joie de vivre cook book!! Dear MT - All this talk of French tartes reminds me of a very saucy and delightful cookbook entitled "French Tarts"! Delightful! And yes, I certainly greatly enjoy your carre choices also. BRAVO! 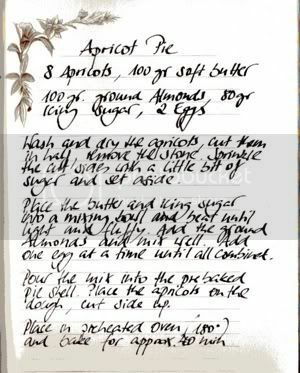 I was looking for the perfect apricot pie recipe and I finally found it! Made two the very first time – one for the family and one for our friends. Everybody loved it! Thank you so much! Dear MaiTai, thank you so much for sharing this recipe with us! Baked it yesterday adding some Amaretto and lavender extract into the filling to boost the flavor. It was a such a perfection! Will try with pears when apricots are out of season. I’ve just bought some apricots from France and immediately thought of you – will bake your wonderful pie again tomorrow – it always turns right and perfect! Cheers from Lithuania – the summer is back and we will have a lovely dinner with friends accompanied by a magic desert! Enjoy a wonderful summer, dear Vilija, and have a fun and fabulous dinner with your friends tomorrow!